Lecturers from the department of Theology and Religious Studies at Nottingham University have aired their views over social networking sites on some of the great stories of the bible. 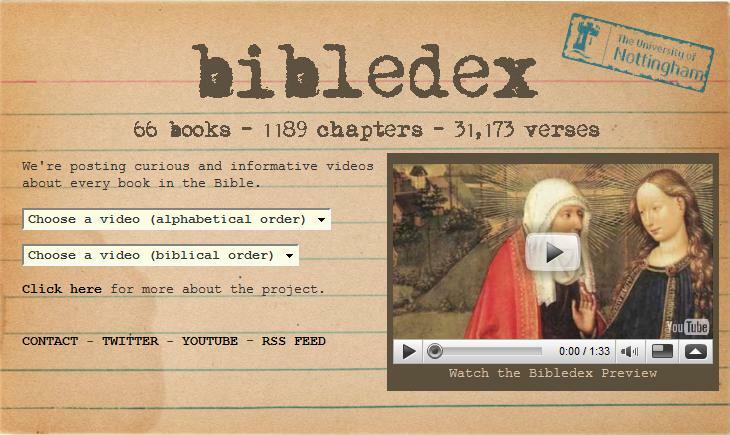 They have created a YouTube channel called ‘Bibledex’ and will be putting together videos detailing all 66 chapters of The Holy Book and questions they raise to make the issues more accessible to students and indeed anyone interested in the history of Christianity. The video series has been compiled by the University’s award-winning film maker in residence and video journalist Brady Haran. Brady, who admits he is no scholar or theologian, is used to working on projects of a more scientific nature. He is currently involved with the making of The Periodic Table of Videos, Sixty Symbols and Test-Tube. It’s a great idea and shows that the department knows the importance of teaching methods using a range of media platforms, to make information as accessible as possible in a world where communication is becoming so convergent. However, could some theologians and those who are religious see the videos as ‘dumbing down’ the most sacred pieces of literature in Christian history? The videos are worth a watch, being of interest to all, regardless of religious background and attitudes. They approach issues surrounding the Bible in a speculative and analytical way and there’s space to post comments and generate public discussion on the topics explored. To have a look at the videos and keep track of new ones being posted, visit their website or follow them on Twitter. I’m using WordPress 2.9.1, not sure of the exact name of the theme. It’s one of the standard ones with wallpaper and pictures added!